ctEGFR Mutation Detection Kit | EntroGen, Inc.
Tumor tissue from non-small cell lung cancer patients is routinely tested for the presence of somatic mutations in the epidermal growth factor receptor (EGFR) in order to predict response to EGFR tyrosine kinase inhibitor (TKI) therapy. However, in a significant number of cases, tumor tissue is not available in sufficient amount for accurate molecular testing. Recent studies have demonstrated the utility of cell-free tumor DNA (ctDNA) from plasma as an alternative source of genomic material for detection of sensitizing and resistance mutations in lung cancer. EntroGen’s ctEGFR Mutation Detection Kit is a non-invasive, ultra-sensitive test to accurately detect the presence of EGFR activating mutations in ctDNA extracted from plasma. The test identifies the most common sensitizing (exon 19 deletions and L858R) and resistance (T790M) mutations in EGFR. Furthermore, quantitative calibrators enable quantification of absolute copy numbers of each variant in unknown specimens, making the test ideal for monitoring response over the course of therapy. This kit requires a real-time PCR instrument capable of detecting FAM, VIC, ROX and CY5 fluorescent probes simultaneously. This test includes reagents required for the PCR amplification/detection, as well as validated reaction controls. 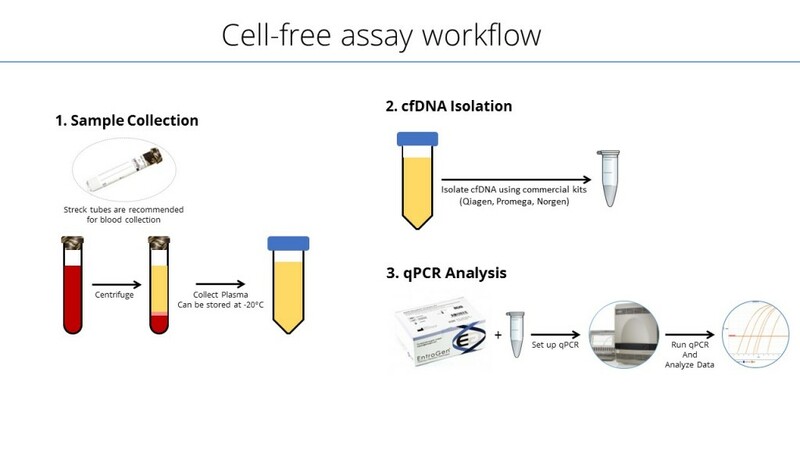 Columns and reagents for cell-free DNA isolation are not included. USA: Available for research use only (RUO). Not for use in diagnostic procedures. Europe: Available for research (RUO) and diagnostic (CE-IVD) purposes. Implementation of a Real-Time PCR based plasma ctDNA analysis for detection of progressive disease acquired by EGFR T790M mediated TKI resistance in NSCLC patients – Jensen, S.G, et.al. Is liquid biopsy a good molecular monitoring tool? Detection of L858R and T790M EGFR mutations in circulating tumor DNA derived from NSCLC patient treated with gefitinib (case study) – Katarzyna, E, Nalejska, E., Lewandowska, M., et. al. Assessment of EGFR gene mutations in cf-DNA in monitoring of response to EGFR TKIs in patients with lung adenocarcinoma – Nicoś, Marcin, Wojas-Krawczyk, Kamila, et. al.